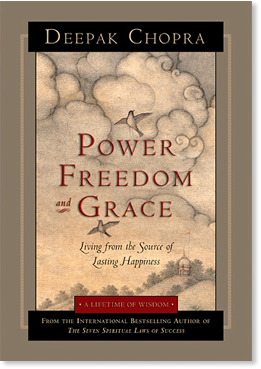 Power, Freedom, and Grace (eBook) - Amber-Allen Publishing, Inc.
Over 300,000 Copies Sold in the U.S. Your essential being is the source of all being — the field of pure consciousness that manifests as the entire universe. In this very moment, pure consciousness illuminates and animates your mind and body, and it is powerful, invincible, unbounded, and free. When you know yourself as this field of consciousness, you have power to manifest your desires, you have freedom from fear and limitations, and you live in grace, which is that state of consciousness where things flow and your desires are easily fulfilled. Joy and sorrow, happiness and suffering, are the play of opposites; they are transient because they are time-bound. Spirit, the essential you, is independent of the play of opposites; it dwells in the silent bliss of the eternal. That’s why the key to happiness is to identify with the unchanging essence of your inner self — to live and play in the field of intelligence that is beyond positive and negative. This field is your source, and it is magical, holy, joyful, and free. To experience lasting happiness, you have to go to a place beyond thought and experience inner peace. It’s not that you have to have a positive attitude. It’s not that you have to shed your sadness and bring in happiness. You have to go beyond the world of duality to the field of pure potentiality and live from your source. Happiness and sadness are different faces of infinite consciousness. Both are transient, and you are neither because you are not a state of consciousness. You are consciousness itself expressing all of these states. Why would you want to identify with a wave on the ocean or a mere drop of water when you are the ocean? You are not the ever-changing behavior of the ocean. You are the water-i-ness of the ocean. And this water-i-ness doesn’t change. Vedanta declares, “Know that one thing by knowing which everything else is known.” For one who knows the Self, the limitations of the world disappear. Chapter 1: What do I want? Chapter 3: Why do I forget who I am? Chapter 4: How do I participate in creating my reality? Chapter 5: Where do I go when I die? Chapter 6: What is the key to lasting happiness? Chapter 7: How can I live with effortless ease? Chapter 8: When will I be fully awake? Chapter 9: What is power and how do I obtain it? Chapter 10: What is freedom and how do I experience it? Chapter 11: What is grace and how do I live it?